Okay, this is one of those unbelievable recipes. If you have never tried this before, you will not believe me until you try it for yourself. Did you know that cauliflower can be totally transformed, become light, fluffy, and be completely unrecognizable? All you need is one head of cauliflower and a food processor. That is all you need to make cauliflower couscous. My kids love couscous. The tiny fluffy pasta is simple to make and is super versatile. The problem is, like most families, we eat a lot of pasta. 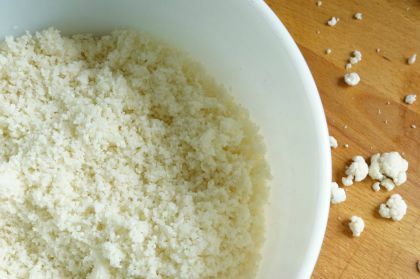 In the hunt for a easy pasta alternative that adds more veggies to our plate, I discovered the magic of cauliflower couscous. Making the switch is deliciously simple and the kids love it. Somehow cauliflower takes on the same fluffy and nutty texture and flavour of couscous. 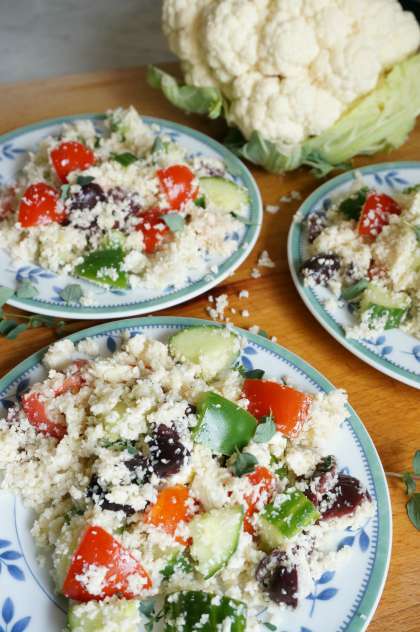 Gather up the ingredients for a classic Greek salad and add some fluffy cauliflower couscous. Everyone in the family will enjoy this extra healthy dish. The best part is this salad makes a delicious addition to packed school lunches. Make up a batch on the weekend and add it to the lunch boxes all week long. 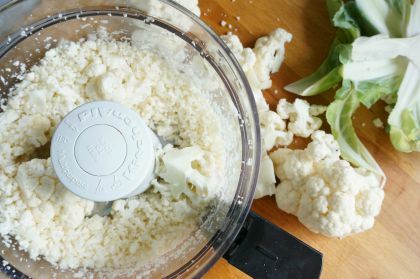 Cut cauliflower into florets that fit easily into food processor and process on "high" until light and fluffy. Combine cucumber, tomatoes and pepper in small bowl. 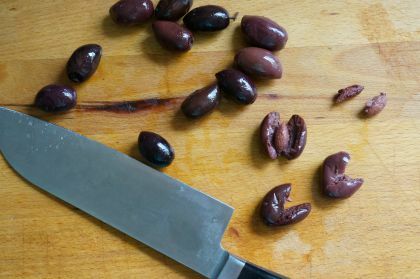 To easily pit kalamata olives hit olive with the side of a large knife. The smash will crack the skin of the olive, revealing the pit inside. The flesh of the olive will easily peel off and the pit can be removed. Add to the bowl of vegetables. T o make the vinaigrette, whisk together olive oil, vinegar, lemon juice, garlic, salt and pepper in a large bowl. Pour vinaigrette over the cauliflower rice and toss to coat. Add vegetables, feta cheese and oregano to the cauliflower and toss to coat with vinaigrette. Our garden has finally hit its stride. The herbs have grown into savoury scented hedges, our beets and carrots are ready to be picked, and our tomato plants are flush with ruby red jewels. All this late summer bounty means that the time has arrived to make one of our all time favourite summer dishes: glorious summer gazpacho. This chilled soup is packed with the fresh flavours of the season; tomatoes, cucumbers, peppers, onion, garlic and basil. While it has taken my daughters some time to come around to the idea of eating a cold tomato soup, they certainly love helping me make this simple dish. Kids love getting their hands messy and gazpacho is the perfect recipe for getting hands on in the kitchen. 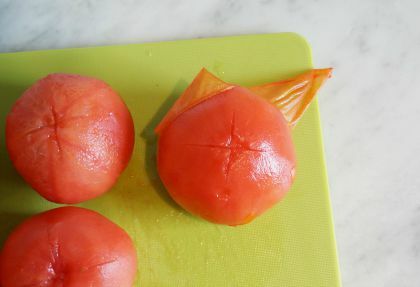 To peel tomatoes, cut a shallow "x" in the bottom of each tomato and place in a large heat proof bowl. Pour boiling water over the tomatoes and let them sit for a few minutes. The skin will start to peel away at the "x". Remove the tomatoes from the boiling water and peel the skin off. To seed the tomatoes, slice the peeled tomatoes into wedges and use your thumb to scoop out the seeds. Let the kids help with this task, it's a lot of fun for little hands. Place the seeded tomatoes in a food processor, or blender. 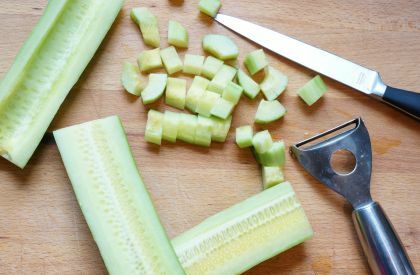 Peel the cucumber with a vegetable peeler. To seed the cucumber, slice the cucumber in half (lengthwise) and use a small spoon to scoop out the seeds. Again, another simple task for kids to do. 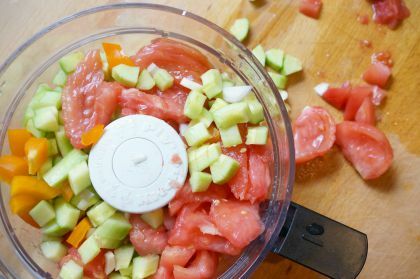 Slice the cucumber into small pieces and add to the food processor, or blender. Add the seeded pepper, chopped shallot and peeled garlic to the food processor or blender. Process until all vegetables are chopped and blended. Add the tomato juice, olive oil, lemon juice, salt and pepper and continue to process until the gazpacho reaches the desired consistency. For a spicy gazpacho, add a dash or two of hot sauce. 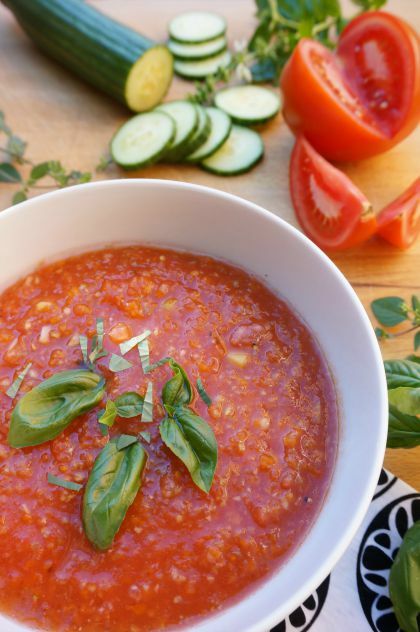 Transfer gazpacho to a large serving bowl and refrigerate until fully chilled and ready to serve. Top each individual serving with basil and oregano leaves. Serve gazpacho in bowls, or for an appetizer serving use shot glasses. Gazpacho make a easy addition to any summer pot luck barbecue or picnic. This recipe makes anywhere from 4-12 servings. There are few things worse then starting Monday morning off with the discovery of an uneaten lunch rotting in your child's lunch bag all weekend. I'm not sure which is most disappointing; the wasted food, the hard work wasted, or simply the stinky, gross food that now needs to be scraped out of the lunch bag. This familiar scenario is repeated time and again from September to June in many households. This school year things are going to be different. This school year the kids are going pack their own lunches and eat them too. It's time to face the facts: your maturing tween may have outgrown the lunch bag you picked out in kindergarten. I clearly remember skipping eating lunch because I was so darn embarrassed by my hideous lunch bag. Set a realistic budget and go shopping with your kid, for lunch supplies. A few things to remember - lunch bag, water bottle, bento boxes, leak-proof resealable containers, cutlery and a thermos. Brainstorming sessions aren't just for the boardroom. Kids are fabulous brainstormers. Grab a pen and paper, sit down with your tween and write down all the different foods you kid might like to eat for lunch. Consider anything that your kid likes to eat. Can it be made portable? Take the opportunity to talk to your tween about what makes a balanced, nutritious meal. While she may love pasta, don't forget to add in some fruit and vegetables too. You might be surprised where the brainstorming session leads you. Being a tween means testing your growing independence. If your tween has decided to try vegetarianism, or has made other dietary choices that aren't the "norm" for your family, start a conversation. Pick up a vegetarian cookbook and experiment with recipes that your new found veggie lover will enjoy and will provide her with the balanced diet she needs. Treat your child with respect and take a food journey with them. Now that the brainstorming is over, it's time to make a grocery list. Have your digitally minded kid open a word processor and create a grocery list. No fancy apps are required, a simple document will suffice. Create a checklist of school lunch staples (juice boxes, crackers, cheese, etc) and leave a blank spaces for recipe specific ingredients. Print the grocery list and post it where your kid can update it on his own. Make it your tween's responsibility to keep track of the lunch groceries. As parents, we know how challenging lunch preparation can be. As you pass the torch to your tween, lend a helping hand. Your assistance in the beginning will help your tween gain the experience and confidence they need to take on the task week after week. Take the opportunity to teach your kid some kitchen skills; how to use a sharp knife, how to properly store food and the importance of a clean work area. Knowledge your child will carry with them into the future. Do as much of the food preparation ahead of time as possible. Set time aside on the weekend to bulk cook and bake, with your tween. Prepare the pasta salads, bake muffins, prep rice dishes, slice veggies, wrap crackers and cheese. Anything you do on the weekend frees up time in those busy weekday mornings. Every school has a different lunchroom facility. Some schools offer paid milk programs, others serve hot lunches, and other lunchrooms are simply a gym filled with tables and benches. Does your child's lunchroom have a microwave? Before you send your tween to school with a big slice of frozen lasagna, contact the school and find out what type of lunchroom your kid's school has. When it comes to packed school lunches, the end of the day is equally as important as the beginning of the day. Make it your kid's responsibility to empty his lunch bag, every single night. Let's put an end to the surprise mouldy containers, inside a stinky lunch bag at the end of the week. Life is all about establishing helpful routines. 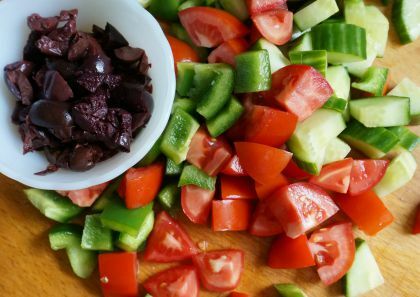 Work with your kid to create a lunch preparation routine that works for you both. If bulk cooking on Sunday afternoon doesn't work, pick another day that works. If lunches are coming home uneaten, sit down with your child and talk about it. Sometimes we make assumptions that aren't accurate. An uneaten lunch might be an indication of negative peer pressure, bullying or time management challenges. The routine you establish now will help your child learn the importance of healthy eating and personal responsibility. Packing lunch together is an opportunity to connect with your tween - it truly is more than a simple packed school lunch.